Contemporary group seating the whole family will enjoy, this 2 pc. sectional features clean lines and sleek track arms creating a striking silhouette. In addition, coil flex suspension combined with plush, boxed edge cushions makes for a soft and supportive seat for up to 6 people. Lounge with family and friends on this functional and fashionable sectional. This sectional is available with your option of seat cushion, arm type, back type and base type. Choose from Full Front (F) or T Front (T) seat cushion; sock, panel, pleated, Charles of London or track arm; boxed edge, knife edge, or bed pillow back; and finally, turned leg, turned leg/ w ferrule, skirt, bun leg or tapered leg base. 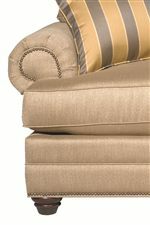 The Custom Upholstery - Estate Customizable 2 pc. Sectional with Track Arms by Bassett at AHFA in the area. Product availability may vary. Contact us for the most current availability on this product. 6000-66T Customizable LAF Sectional w/ Corner 1 98" 41" 40"
6000-61T Customizable RAF Sectional w/o Corner 1 83" 41" 40"
With a wide variety of items ranging from sofas and sleepers, to sectionals and storage ottomans (not shown), this collection has everything you need to create a comfortable, functional, and stylish ensemble. Make yourself at home by personalizing the look and feel of your living room with the customizable Estate collection. 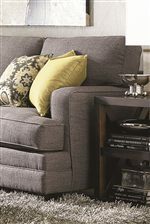 The Custom Upholstery - Estate collection is a great option if you are looking for furniture in the area. Browse other items in the Custom Upholstery - Estate collection from AHFA in the area.